I have barely heard Manga Sushi talked about in Nottingham food circles, which is surprising given its location. The restaurant sits parallel to the most written about street in the city, where Red’s and George’s have pitched up over the last couple of months. Manga too arrived in early 2015 but hasn’t made the ripples of the aforementioned names. Its quite basic inside, dark decor with the odd Japanese ornament, and quiet on this midweek evening. The options follow a similar pattern to those Japanese establishments elsewhere in the city, with a few Korean dishes thrown in amongst the Japanese fare. Having ordered the obligatory Asahi (£3 for a small bottle) we felt Sushi would be a good place to start. There were lots of options on the raw fish front but the dragon roll, priced at (a baffling?!) £15.88, seemed to fit the bill. It looked pretty good on an arrival and was plentiful for 3 people as a starter to share. From the description I expected the pieces to be a little more diverse but they ended up being quite similar. We were happier than a friend though, who ordered a yakitori at £5.20, and ended up with some miserly skewers of chicken. 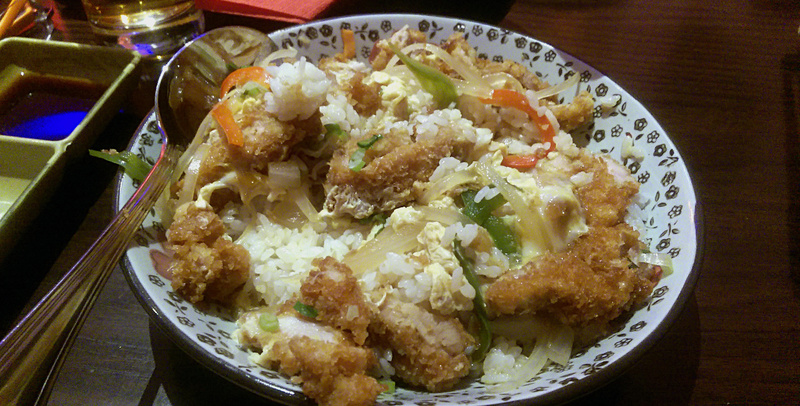 Chicken Katsu Donburi (£10.90) was a pretty hearty main course by Japanese standards. The rice and breadcrumbed chicken is bound together by a little egg that is lightly fried. That richness that’s bought by the yolk and katsu chicken balanced by the freshness of some crunchy onions and peppers. Good textures and flavours but you’ll often be left with some rice left and not a lot to go with it…I utilised some soy and wasabi to finish things off. I visited Manga with few expectations and it was perfectly decent. I just couldn’t help feeling that with the likes of Pan Asia & Bonsai as competition Manga really doesn’t offer anything different. Comedy .88 pricing aside too it doesn’t compare favourably on the value front especially either, I struggle to think when I might be back.